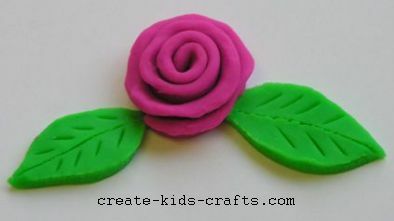 Welcome to my free kids crafts: playdough ideas for kids section. Children are naturally creative, and of course there are many playdough ideas a child will come up with. Here are some suggestions and starting points for cool ideas for children, parents, and all others that play, teach, and work with kids. Results will vary depending on age and skill level of the child. 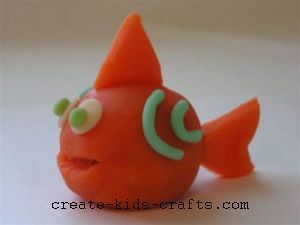 These playdough ideas are fun for kids of a wide age span. I've taught playdough classes for kids aged 4 to 12 and they've all really enjoyed these ideas. If your kids are too small to make these creations themselves, than these ideas are for you parents to do alongside your children. Take the time to play with your kids. You'll be glad you did and so will they. 1. Roll out a thin, long snake and press it flat. Loosely roll it up like a rug from one end to the other. Spread and press each layer out a bit. 2. Leaves: Flatten a piece of playdough with either your hands or a rolling pin so it is all the same thickness. Cut out two leaf shapes with a plastic knife and press them onto the bottom of the rose. Make designs on the leaves with a plastic knife. NEW! 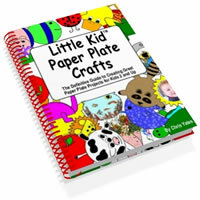 Visit our other website: www.discover-preschool-activities.com for lots of free preschool activities!